As the curtain fell on the 16-bit era, gaming icons Mario and Sonic left the sanctuary of their 2D homesteads, seeking fame and fortune amidst the vast, uncharted frontiers of the 3D landscapes that lay to wait. 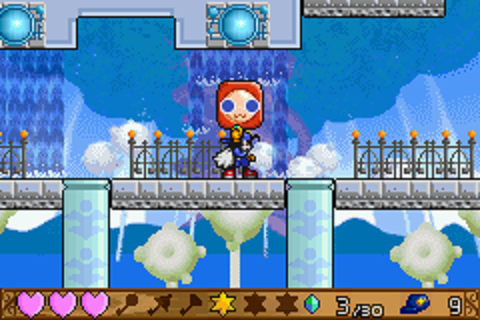 By the turn of the millennium, the traditional platformer crown, once considered pivotal in the influencing of a console’s success, had passed almost unnoticed, almost unchallenged, into the lap of Klonoa. But what’s important to establish is that this was far from a de facto prize. Even had Nintendo and SEGA channelled all of their attentions on projects adhering to their mascots’ early-nineties heyday, they’d likely still have struggled to match Namco’s efforts. 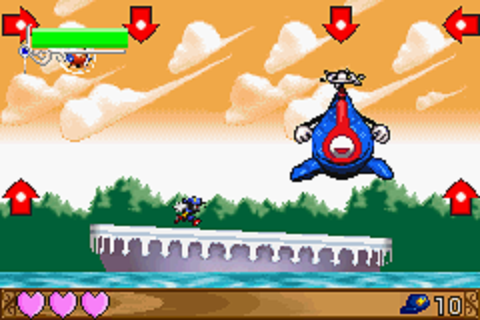 Klonoa may not have had the fame, but over a period of around four or five years, it quickly and quietly built some impeccable credentials, and after two dazzling console outings put him on the map, the flop-eared hero cemented his place among gaming’s top platform performers with a charming and addictive portable outing. 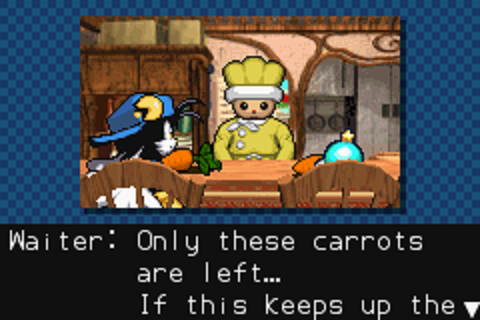 Though perhaps we shouldn’t be surprised, Klonoa was on top form for his GBA debut. Not content with looking about twice as attractive as any other handheld title of the time, Empire of Dreams backed up its stunning visuals with a truly exemplary, complete platforming experience. A perfect difficulty curve ensures a measured but constant challenge; levels demand plenty of thought but rarely result in hours of frustration, whilst the steady stream of innovations and watertight level design will see connoisseurs purring with delight. 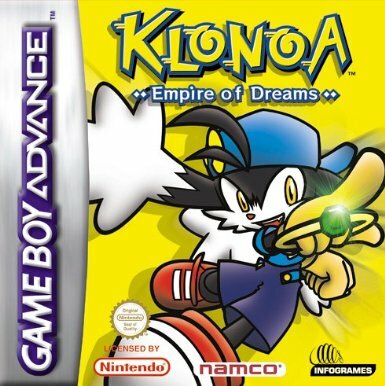 Empire of Dreams’ story plays out as a fable of sorts, with Klonoa awakening in a mysterious kingdom accused of dreaming by King Jillius, an act outlawed on account of his own insomnia. He challenges our intrepid hero with travelling to the five surrounding lands, defeating monsters and, with a bit of luck, restoring a measure of harmony. It abandons the pseudo-3D visual style that characterised its console forebears, and though noted this as a minor negative, in reality it was a wise move, as both visually and in terms of playability, the Advance is on much stronger footing technically when it sticks to two dimensions. The other element that renders such a criticism redundant should be rather more obvious: it looks an absolute peach. 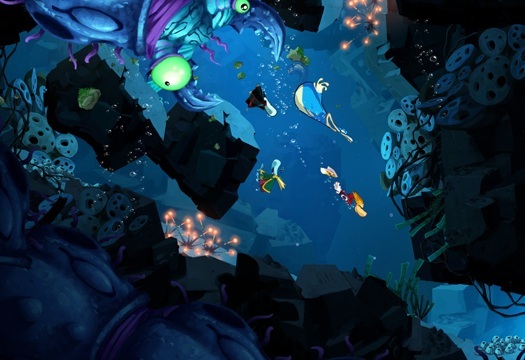 Featuring incredibly smooth, sharp and well-defined animation, EoD is awash with rich colours and varied, multifaceted backdrops that lend the vibrant cartoon levels a remarkably stylish verve – every level is a joy to behold. And this is no mere downsizing of what went before. If anything, the move to the small-screen has encouraged the developers to think more creatively, and they show their class by adapting the nature of the core levels, which are now as much driven by logic and problem-solving as they are pure platforming. Of course, there’s still the usual spike-pits, traps and enemies to be mindful of, and it does all of the meat ‘n’ potatoes gameplay really well thanks to some super-responsive controls and excellent collision detection. 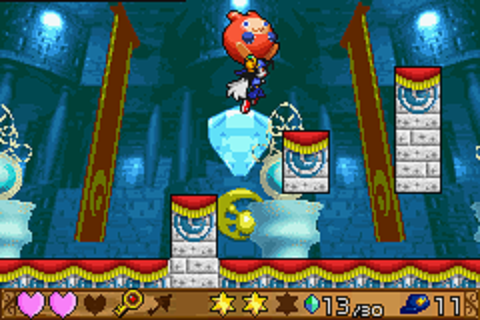 Indeed, there’s even the odd break to allow for some concertedly faster-paced levels, with a modest handful of snowboarding treks and some great speed-levels that sees Klonoa having to progress at a strong pace as the screen automatically edges along behind him, a little bit reminiscent of the early Wonder Boy titles. But it’s so refreshing to find a game of this type that really gives your noggin a workout. You’re constantly required to solve mini-conundrums based on Klonoa’s move-set, thus allowing him to collect the three gold stars needed to open the level’s exit portal. Sounds simple, but along the way, you’ll have to mix and match abilities, exercise considerable timing skills, locate keys and overcome some devious testers. 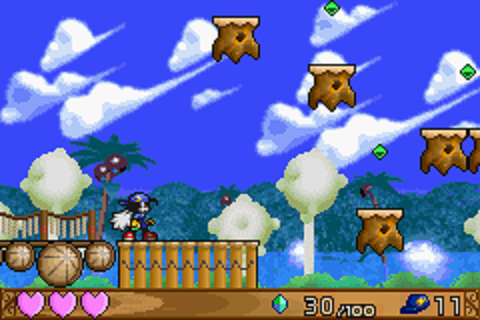 At the outset, you have Klonoa’s simple but versatile Wind Bullet; essentially, this allows you to pick up an enemy, and either bounce them to achieve a double-jump, or hurl them horizontally across the stage. During the early levels, they may be needed to reach a higher ledge, or to activate a switch. But later on, things develop, and every new world throws you a curveball. You’ll encounter exploding foes that are useful for taking out obtrusive boxes, but are a risk as you can only hold on to them for a limited time. 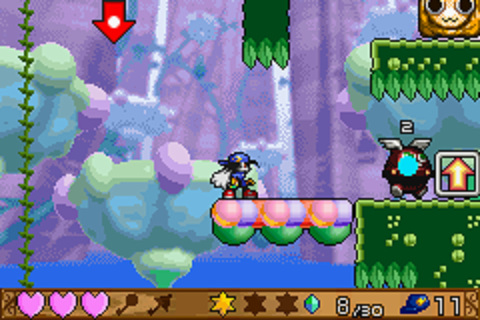 Klonoa can’t touch water, but he can hold objects above him to walk through waterfalls, or use boxes to block wind funnels. The addition of bounce arrows, which allow you to alter the trajectory of certain thrown objects, adds another layer of intrigue. Like the best puzzles, the solutions are often fiendishly simple, staring you in the face as you consider all manner of possibilities. And this is why it’s so easy to love Empire of Dreams. A lot of games make a song and dance about gimmicks or technical innovations; but here is a game that, with relatively modest hardware specs, constantly delivers new and smart ways to challenge the gamer, whilst working beautifully within its means. Sure, it’s not going to rival Lunatea’s Veil in the polygon count, but you’re never left thinking “they should have done that better” or “they didn’t get that how they wanted”. It’s all just so. And it’s all just brilliant. Top-notch graphics, a class soundtrack, excellent gameplay, dozens of levels, gorgeous presentation; yet again, Klonoa just goes and does it. 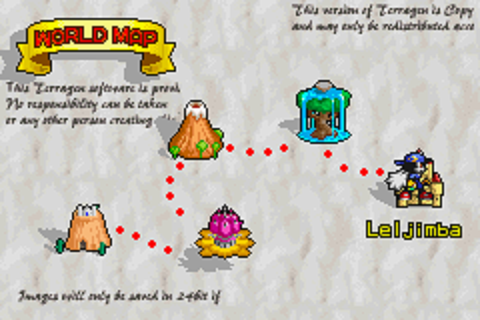 There’s somewhere in the region of forty levels in all, and with multiple mini-challenges to overcome on each stage, there’s an awful lot of mileage, even if you are able to make steady progress. An excellent family-orientated game in the mould of a Mario; Empire of Dreams is simple enough to grasp, and though the excellent boss-battles may be a shade on the easy side for gaming veterans, they do at all least task you with putting what you’ve learned into practice. Playable ten years ago, playable now and sure still to be in another ten, it’s a game that will stand the test of time, and one all Advance owners should treat themselves to.